In most other branches of veterinary medicine companion animals present for annual vaccinations to prevent the development of some of the more unpleasant and potentially life threatening diseases. The actual administration of the vaccine however, is a relatively small part of the benefit of the annual visits. Such regular ‘check-ups’ offer a chance for the veterinary surgeon to thoroughly examine your pet, potentially picking up on both physical and behavioural problems as early as possible so they can be nipped in the bud or even better, by sharing the very latest information on pet health, prevented completely. 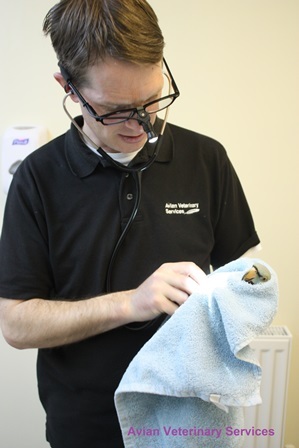 As such, despite in the UK no annual vaccinations being currently recommended for the avian patient, we at Avian Veterinary Services actively encourage annual ‘well-bird checks’. 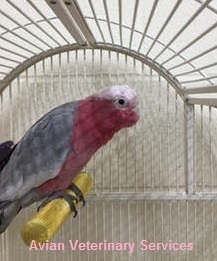 Birds are ‘non-domestic’ species that instinctively try to mask symptoms when they are ill to avoid signs of weakness to ‘predators’ and so by the time they show outward clinical symptoms such as; vomiting, increased respiratory effort or neurological signs, the disease is often in a very advanced stage and may well be beyond treatment. Contrary to popular opinion, birds are actually incredibly hardy creatures and have amazing powers of healing, providing such illnesses are identified early. Prevention in all forms of medicine is also far more cost effective than treatment of disease, which is another reason we feel regular health checks are so important. 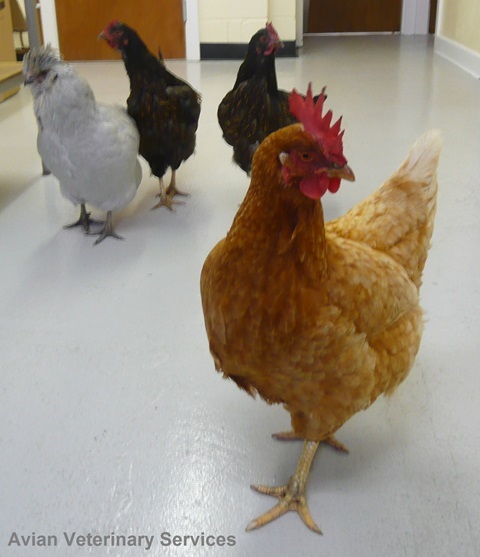 At AVS our annual ‘well-bird checks’ are a minimum of half an hour. We believe the more traditional 10-15 minutes, which seems to have become the norm in most areas of veterinary practice, is not sufficient to carry out such thorough examinations as well as discuss findings and convey all that is required to the owner (In fact when choosing an avian vet two very important questions to ask are: 1. How long are the avian appointment slots? and 2. Do they offer an, ideally on site, ‘out of hours’ AVIAN emergency service?). What is involved in a ‘Well-bird check’? We talk and more importantly listen to any queries or concerns the owner may have regarding their pet, his/her management and behaviour. From over 20 years of dealing with companion birds we find often subtle, seemingly insignificant, pieces of information are invaluable clues to underlying issues. 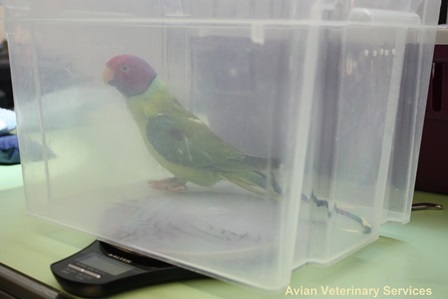 The bird is weighed to determine if this is indeed the correct body weight for the age and species of bird. 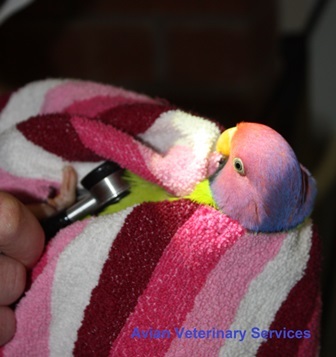 A thorough ‘top to toe’ hands-on examination is performed using a focused light source and magnification where required to examine eyes, ears, beak and oral cavity. A stethoscope is used to evaluate heart, lungs and air sac system and the abdominal area / skeleton palpated to check for any abnormalities. 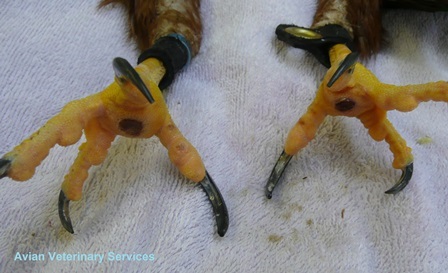 Any routine nail or minor beak maintenance can be carried out at this time. A faecal or in some cases a ‘crop wash’ sample is checked under the microscope for the presence parasites. Further disease testing via blood sampling or swabs may be advised and undertaken if dictated by the primary examination. A ‘debriefing’ with the owner(s) on any findings, and nutritional, behavioural or management queries are addressed with a ‘plan’ for the next 12 months formulated and discussed. As previously mentioned prevention and early disease detection is critical in the avian patient and what follows are a selection of clinical cases/conditions that illustrate this. In most cases a detailed history taking during consultation and physical examination can be enough to tip us off and allow us to address underlying hypocalcaemia. If, especially a grey parrot, is fed an un-supplemented ‘seed mix’ diet and has no access to natural daylight or an appropriate UV bulb, it is at risk of developing the disease. Symptoms include; seizure activity, abnormal heart rhythms, egg binding and impaired blood clotting. Appropriate husbandry and management can all but prevent this potentially life threatening syndrome. Bumblefoot is essentially a progressive ‘bed sore’ often associated with a combination of factors including; repetitive trauma, inappropriate perching, dietary deficiencies and/or obesity. If picked up early and addressed via appropriate husbandry changes, topical preparations or at the most systemic antibiotics/anti-inflammatories it is easily resolved. If advanced, however, it can require multiple surgeries or even become untreatable if significant damage/infection of bony structures occurs. Aspergillosis is a fungal infection of the birds’ unique respiratory system. Again this is a disease that if caught early, by taking note of subtle behavioural changes (e.g. reduced talking, activity level) weight loss and/or increased respiratory noise detected using a stethoscope, with modern antifungal drugs is curable. However, if advanced to the point it affects multiple organs systems it can sadly be beyond treatment. 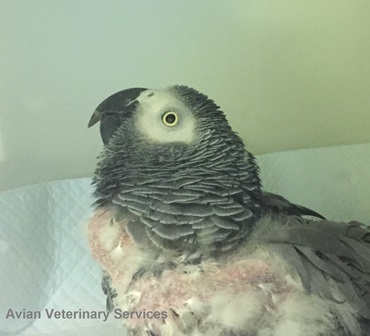 Intestinal parasites are relatively uncommon in captive birds and particularly rare in those housed indoors, which is why at this point we do not recommend routine worming in companion birds, especially as toxic effects of some of the more commonly used drugs e.g. fenbendazole and ivermectin, have been reported in a number of avian species. A faecal examination undertaken during an annual health check is able to identify any existing parasites and treat appropriately and only if necessary. Heart disease is again thankfully pretty rare in companion birds but any abnormalities picked up on annual health checks can be further investigated using heart scans and ECG monitoring by our consultant cardiologist thus allowing the very best of care and improving outcome. Feather plucking in parrots (and indeed some falconry birds) has been described as a reflection and method of self-medication for an ‘anxiety’ of some form. In the vast majority of cases this arises due to a combination of developmental, management, nutritional, behavioural and disease factors. Whatever the inciting causes, if the behaviour persists for any length of time it quite often becomes a hard wired, self-rewarding ‘habit’ and as such, even if the initial causes have been addressed, will often progress and be extremely difficult if not impossible to cure. Appropriate optimal husbandry and management, underlying disease recognition/treatment and the early instigation of training/foraging activities for example can hopefully prevent or at the very least dramatically reduce the incidence of this extremely frustrating and distressing situation. This is another example of prevention being FAR better, and more cost effective, than cure. In summary by keeping in touch with the ‘inside’ as well as the ‘outside’ of the bird, we can prevent debilitating situations or at least detect them in their early stages thus minimizing treatment protocols and allowing your pet bird to live a longer, healthier and pain-free life. 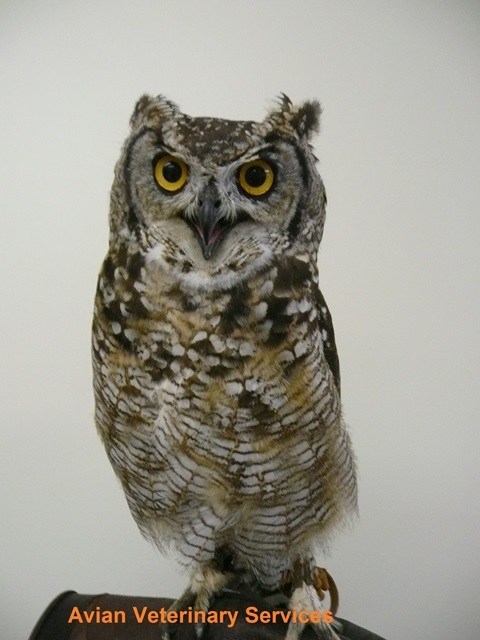 Feel free to contact us at the practice on 01606 350 410 for details regarding our well-bird or indeed pre-purchase consultations, in which we will again dedicate at least half an hour to help clients ‘match’ the right species of bird with the specific home environment and prepare for its arrival. We are now able to offer SMS text or email reminders for interested parties to help keep track of when the next check-up is due, so again feel free to contact us to register for this service.